The girls made these simple paper totem poles during our study of Native Americans. The girls glued their animals down the center of their brown paper, saving the wings to attach to the back. We rolled the paper into a tube and secured with clear packing tape. The last step was taping the wings to the back. Cute and easy! The girls also had a great time making up stories about the animals on their totem poles. 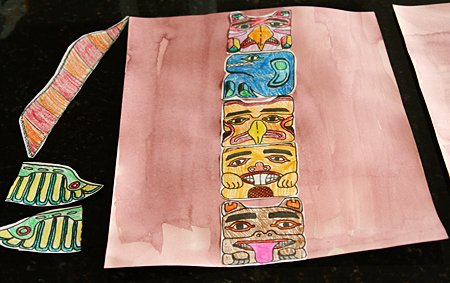 I really want to make a big totem pole for our backyard – wouldn’t that be neat? I’ll have to do this with O. She received a Kaya doll (american girl) for Christmas, and she is VERY interested in Native Americans. Love this Totem Pole. Would love to have you come link up with us!